L to R : The original bed is the 2 middle lines (what I'm going to call tracks 2 & 3) that went up hill north into Otisville. 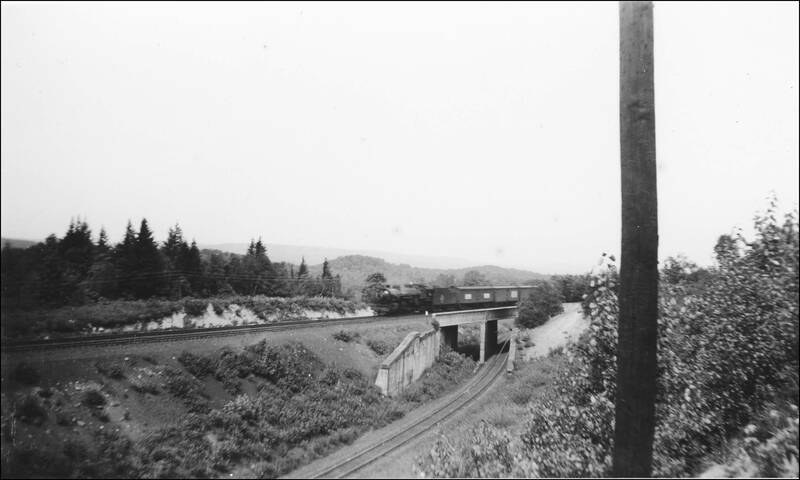 Circa 1908 the new, lower-elevation line went in (far left: 'track 1') and thru the new Otisville tunnel. But there was a 4th track (far right, 'track 4') that curved off to the right, running under the original elevation, then curving back to pair with the track 1. At least that's my assumption, since the Otisville Tunnel clearly is wide enough for 2 tracks. I've looked thru the gallery where the above 2 pics came from thoroughly, and what I'd like to further learn is the specific track layout WRT switches both north & south of this area. ANother pic shows 3 tracks running south, at least thru the first curve south of Graham. Does anyone have any schematics for this era / area or can point me toward them? Thanks. I think you are looking east here at Howells. 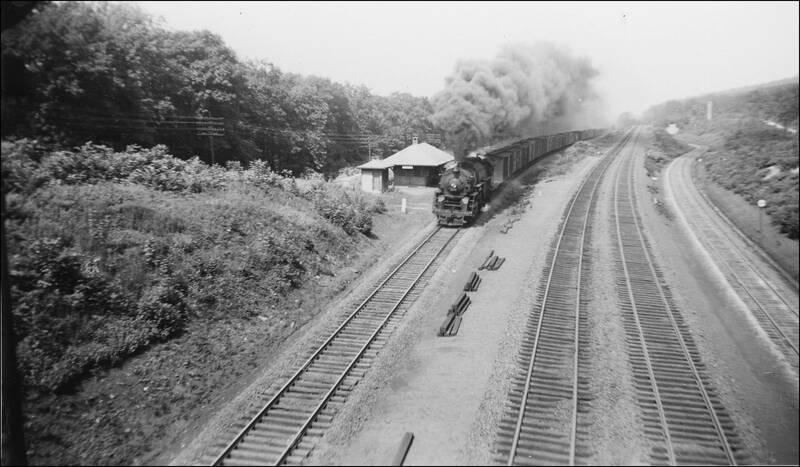 The two tracks up the middle is the passenger main to Middletown, while the two outside tracks are the Graham line to Harriman. Good place to check would be Stauffer's ERIE POWER. No; I am 100% positive this is the Graham station area- the station location, the roads, the steel bridge (in other pics), the concrete underpass, the smelting chimney, the low stone wall... I was walking the bed last weekend and noticed a concrete square about a foot & a half wide in the bed... in one of the pics I see a semaphore was in that same spot- it's Graham. I've been spending summer vaca time there since '70 so I know the area very well. Is there a similar underpass near Howells ?? Again I say look at the pictures and captions in Stauffer's ERIE POWER. My computer at home is out of service, but if I remember tonight to look I will and get back on Monday. Thanks, I'll try and find a copy somewhere... there's 2 on Amazon right now... for $182 ea! OK...you'r right, it is Graham. Stauffer has several pics at that location. I was getting it confused with Howels Jct. The second photo is what was known as the Guymard Over (or under) Pass, correct? I cannot tell you if it had a proper name/ reference, but I CAN tell you it IS right next Lake Guymard, tho now it's buried in the woods. A puzzling structure to the unknowning to be sure (which is what I was when I first 'found' it); I had been picturing a dead-end siding from the Otisville side, based on the angle of the underpass... possibly to do with the smelting operations of the late 1800s. I never dreamed the underpass led back to the same ROW.... and with the overgrowth there now, also did not envision a 2-track bed over the top, nevermind any track over the pass at all. MSN.com/maps does not show it in the bird's eye satellite view: limited compass directions in the area and the bird's eye cuts out right south of the underpass. But it's located between the 'car bridge' to the south and the smelting chimney to the north where the road to the right jogs, if anyone cares to look. The original line is still clearly visible in the sat images, tho. I will take some pics if I get back up there this summer... but the thick trees are not going to be very cooperative. Just got back from a weekend in this same area (Guymard- between Otisville & Port) and finally got the following pics, thought you guys would be interested in a 60-year 'before-n-after'. Credit for all B&W pics goes very thankfully to Ron Dukarm's gallery (>>http://dukarm.railfan.net/.ps.cgi?search=graham&sort=byage<<) - I have resized them to a more viewable frame and left the original link right below it, but I highly recommend viewing them via the gallery, for there they are higher rez and can be enlarged. My pic was taken from the same approximate vantage point- the lake-side of the car overpass. What looks like a dark post to the left (about 10 o'clock from the standing water) is a signboard attached to the old station concrete platform (see next pic). What's branching off to the right (what I always thought was a railroad-related 'service road') is the original dual track elevation over the mountain going to Otisville. Now it's an overgrown 2-tire track that goes a few miles to meet up with a public road right near the Otisville tunnel. Note: about 1 locomotive length in front of the pictured loco, there are 3 horizontal white lines on one of the blocks in the stone wall. The same 3 horizontal white bars are still visible (right where the branch is laying out over the wall); I need to check them up close to see if they're other than paint, because if they are, they've been repainted. No idea at present what they represent. Cryptic symbolism or a humdrum explaination? No evidence of the 2 buildings seen in the 1948 pic remain today. The RR overpass today is a narrow 2-tire track, there are mounds of road bed material & trees to either side- which always reinforced to me it was only ever a 'car' road... but the overpass paces off at 25-feet wide; clearly wide enough for the 2 tracks that used to cross it. Scratch down thru the leaves and theres the original 'black dirt' sub-bed. Walk straight ahead for a few minutes and the towering walls of the RR underpass appear. This shot is pretty much taken from what is seen of the right-hand track in the far right of Ron's first pic up above, looking in the same direction. In that same first pic of Ron's, where the right-hand track curves to the left in the distance, one can see a vertical structure right above that. This was a chimney connected with the lead smelting done in the area in the late 1800s. If you enlarge Ron's pic, you can see the round opening in the base of the chimney. Hope you enjoyed these as much as I enjoyed hiking thru the woods with my sons and 'laying out' the past as best we could! I notice that the Guymard Overpass has room for two tracks. Did it ever have the second track? Also, what purpose did it serve? Possibly to allow trains headed on the Graham Line to avoid crossing opposing traffic? Very nice before & after set of photos, thanks very much for sharing them! WQ59B wrote: Does anyone have any schematics for this era / area or can point me toward them? Thanks. Take a look at Historic Aerials. 1959 is by far the clearest image showing the layout with the split ROWs (one over the mounatin, the other thru the tunnel). By the 1971 imagery the line over the mountain had been abandoned. Don't even bother with the 1968 imagery, I think someone goofed on the geo-locating of the files. A search of Historic Map Works along with the earliest imagery from HA indicates that the new line/tunnel were put in sometime between 1903 and 1908, but that's subject to debate. Russ I don't see any evidence of there having been a second track under the overpass in the clearer imagery, but it's possible it was originally built with possible intention of doing so in the future... Let's not forget back then RRs weren't afraid to spend money and would typically over-engineer things. Though looking at one of the black and white photos they'd have to do a little realignment with the first track as the curvature out would have them running over the concrete "wing".